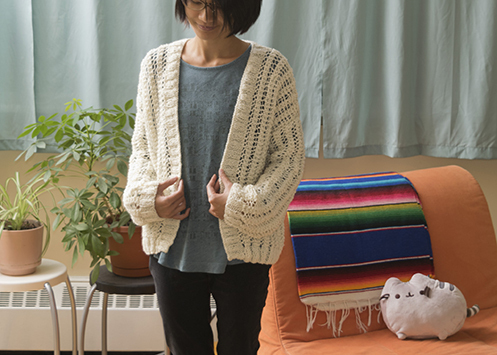 I wanted to make a cozy, sort of slouchy fall cardigan that one would want to relax in. I was going to name it something poetic like “lakeside” to evoke the relaxed cottage vibe, but then I posted an in‐progress picture on social media and one of my friends commented that it looked like ramen. And I thought, that’s a much better better name for it! After all, I can relate to relaxing at home, watching movies on TV and eating ramen more than I can relate to relaxing at the cottage, which I’ve actually never done in my life. The cardigan is made of 5 rectangular pieces. These pieces are seamed together, then a 2x2 rib is worked along the front pieces and back of neck for collar. It has a loose‐fitting body with fitted sleeves. It’s also made with a loose gauge, so it’s pretty plushy. With larger needles, CO 80. Work k2, p2 rib for 8 rows. Work 1 row lace pattern by Magda Makes until piece is 21″, or desired length, from CO edge. Fasten off loosely. Work 1 row lace pattern by Magda Makes until piece is 17″, or desired length, from CO edge. Fasten off loosely. With right sides together, sew shoulder seams together. 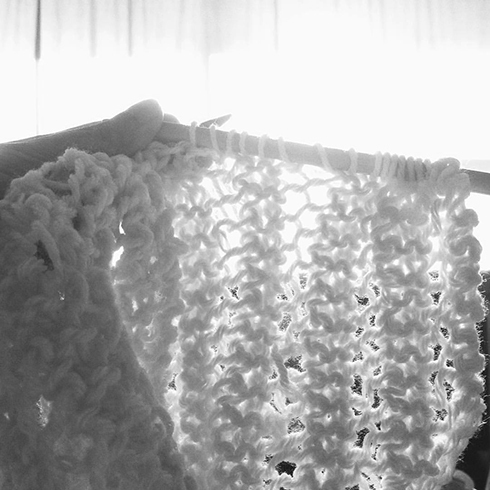 Work k2, p2 rib for 8 rows, fasten off purl‐wise. Find mid‐point of sleeve, match this point to the shoulder seam, pin sleeve to body, then sew sleeve to body with right sides together. Repeat for the other sleeve. Sew sleeve and side seams together. Weave in ends. Super cute lined paper pullover, I want one! From Knit Picks. 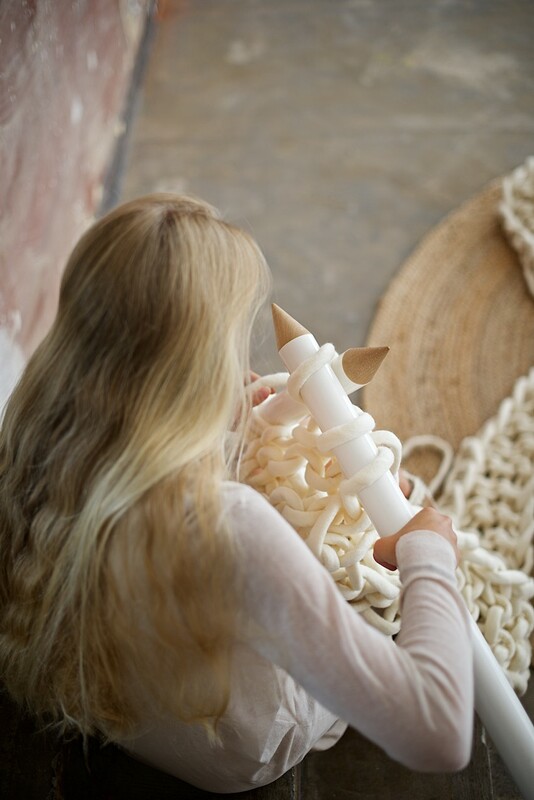 Often wonder how one would knit such thick wool… here’s a tutorial from Lebenslustiger. Love this silly‐looking rattler. From Lanukas (English translation of the pattern at the end of post). Got a new grey sock? You can make your very own Pusheen plush! :D From My Pastel Cafe. 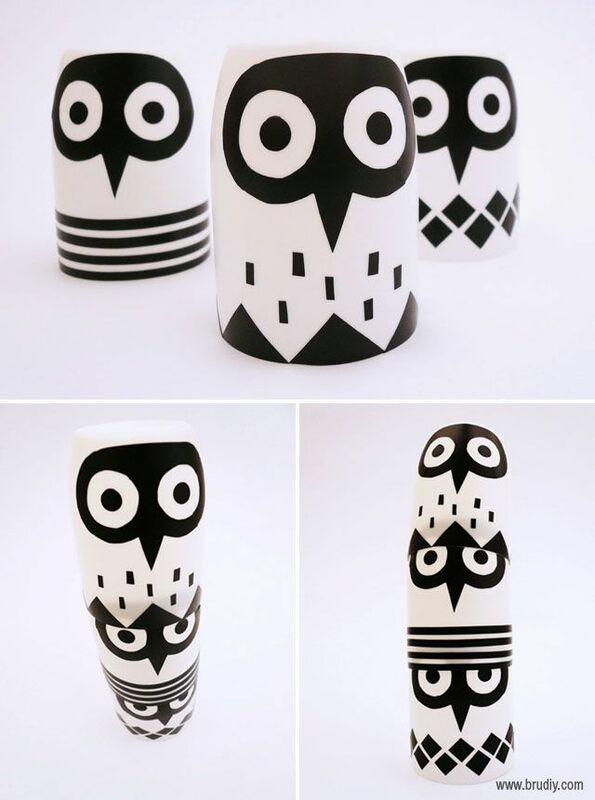 Awesome night owls (or owl night lights) from BruDiy. Just discovered on Pinterest! 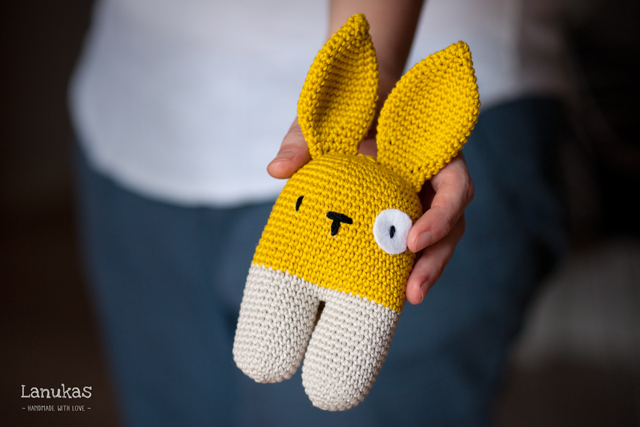 A free Wool and the Gang pattern! 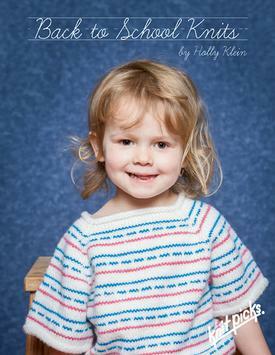 :D :D :D I’m a big fan of the sweater patterns by WATG, but almost all of their patterns are sold in kits, which I can’t really afford… so a free sweater pattern is very exciting! Now I just have to get myself some 12mm and 25mm needles. Sign up and download at WATG. 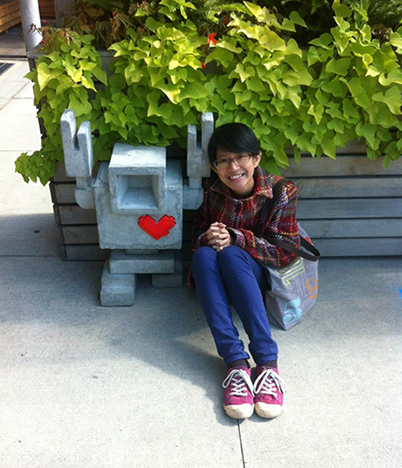 You can read more about the Lovebot here :D and see where the Lovebots have been placed and their stories here. 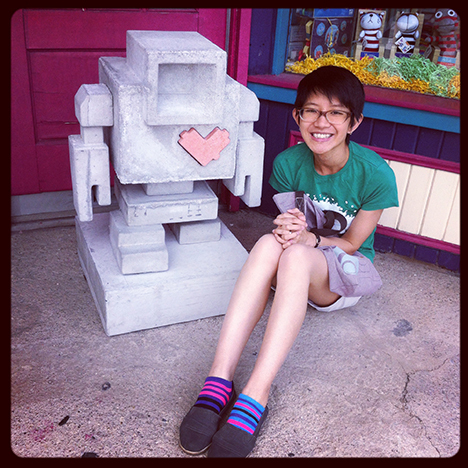 This is in front of Mabel’s Fable, a magical children’s bookstore. This is in front of Thor Espresso Bar near the waterfront. 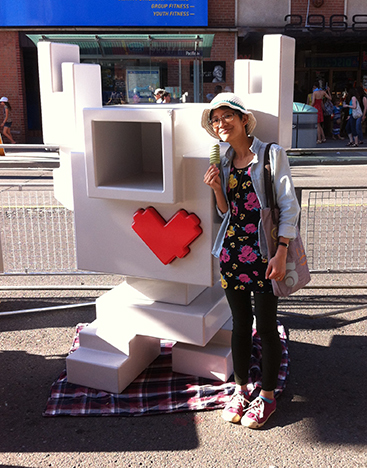 Keep an eye out for the lovely robot if you’re in the neighbourhood! Hope everyone has a wonderful week! Not that I feel particularly sad about the end of summer. I’ve had lots of fun this summer, but I’m sure there will be good times in the fall and winter too. There’s just something timeless about black and white photographs, capturing those everyday moments that are cherished. 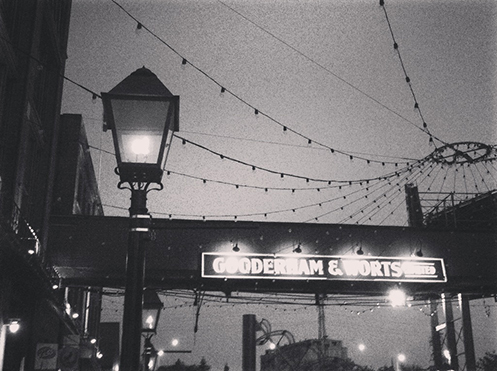 We visit the Distillery District at least once every summer. Took this picture while marveling at the gas lamps lit up at dusk. 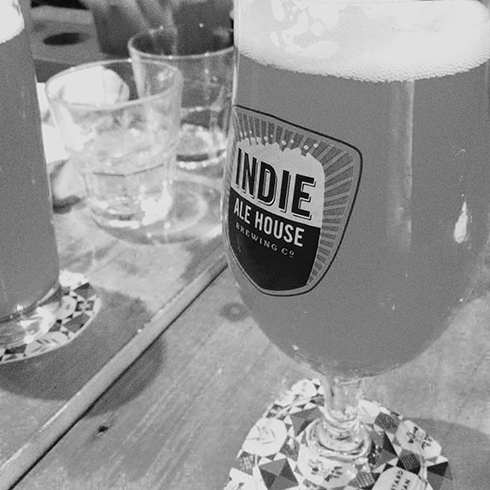 We got to enjoy some craft beer and lengthy conversations at the Indie Ale House with our good friends, whose children were camping out at their grandparents’ for the week. I think this was the first time we got to do this in 10 years :P I’m by no means a connoisseur of beer, I mostly order based on the names of the beer (I’m a sucker for interesting/pretty product names, I think I’ve mentioned this before…). So here I was having a “Rabbit of Caerbannog”, which I later found out was “an immensely cute but bloodthirsty rabbit‐like monster found in Monty Python and the Holy Grail,” according to Villians Wikia. 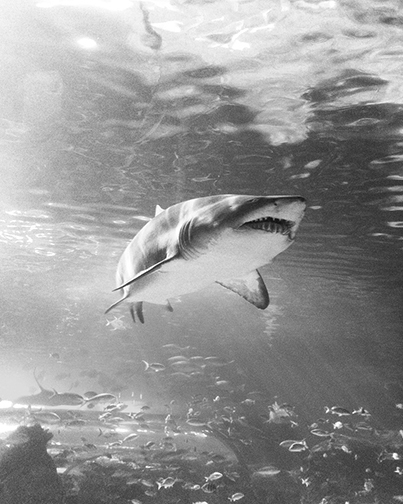 A majestic shark at the aquarium. I’m quite proud of this one. Not that the summer would stop me from crocheting or knitting, but I’m excited about making cozier things when the weather is cooler, and my holiday crafting list, the plushy scarves and mittens I’m going to make new wool, and this! I’m experimenting with making a pattern and can’t wait to find out whether it will work out, and I will surely share with you if it does! And last but not least, I present to you — jellyfish magic at the aquarium. The jellyfish were lit up with kind of a strange pink light (I guess otherwise they’d be difficult to see since they’re translucent), which my phone camera couldn’t capture very well, so I figure I’d just put a black and white filter on it in Instagram. I think it kind of creates a feeling of being in the deep, dark sea. And it’s just so elegant the way jellyfish move in water. Cheers to a fabulous summer, and many more summers to come!